The special birthday has passed, and the presents have been unwrapped. It’s time to tell your family and friends that the gift of their company on your birthday made the day truly special. If you can’t find the right words to express your heartfelt gratitude, worry no more. 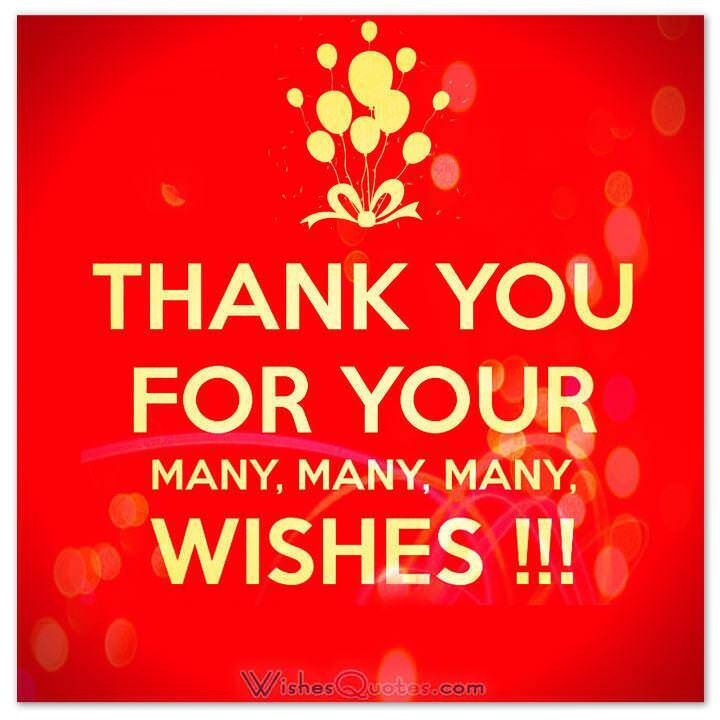 Let the following list of thank you messages inspire you to sit down and schedule a gratefulness marathon where you write, text, tweet or email all the special people who helped make your birthday party a memorable one. Make sure they know that you appreciate their thoughtfulness. In today’s busy world, people who make time to be with friends on their milestone events are keepers. Neither snow nor rain nor heat nor gloom of night could stop you from joining my party. For that, I am truly happy. Today, I woke up thinking that I should count my blessings after such a memorable party. 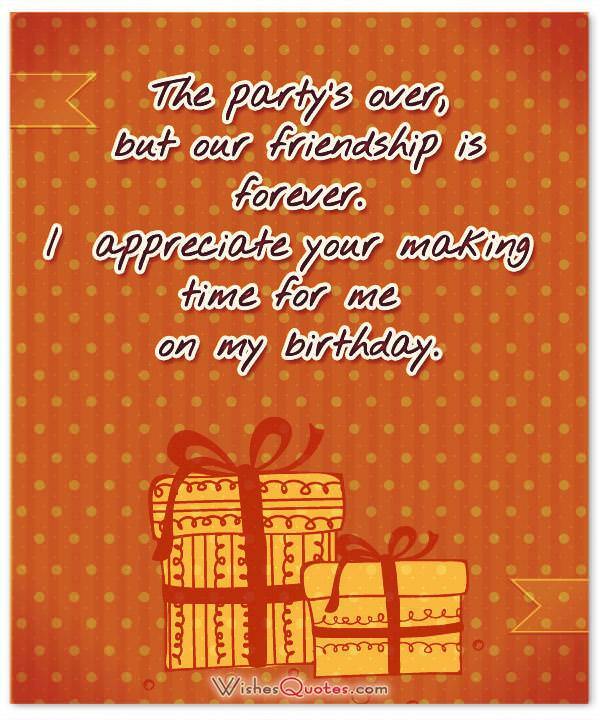 You count as one: Thanks for being a true friend. The party’s over, but our friendship is forever. I appreciate your making time for me on my birthday. So much in life is fleeting: wealth, beauty, physical prowess. But the love between friends forged by sharing our joys, sorrows and hangovers will live on. 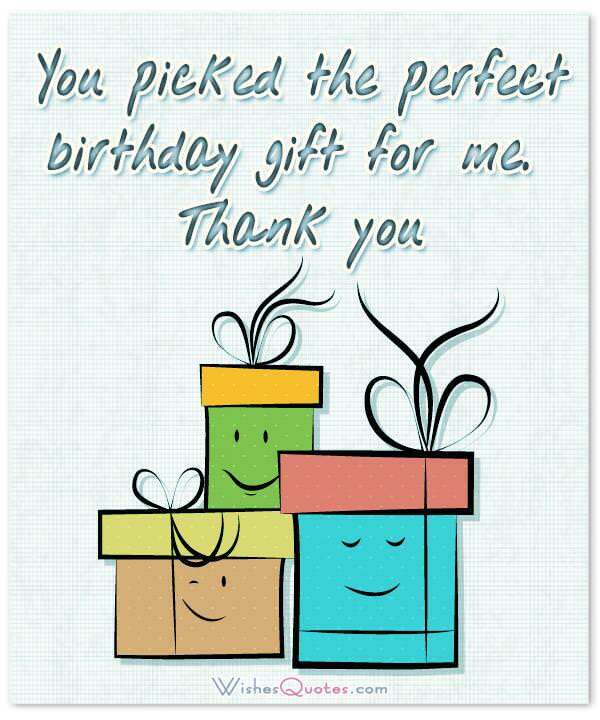 You made by birthday special. Thanks! You are the reason I am smiling this morning. That was some party last night, and your presence made it mind-blowing. You made me feel special. This little heart of mine; you made it shine with your presence at my birthday party. Here’s to more memorable events like this! Thank you for the gift of your presence at my birthday party. It would not have been so awesome without you. They say it’s the thought that counts, but you brought all of you and brought the house down with your party spirit. You were amazing. A hug, a kiss and a wonderful friend who drove so many miles in weird weather to be at my party – what more can I ask for? It was a dark and stormy night… and still you came to my party. 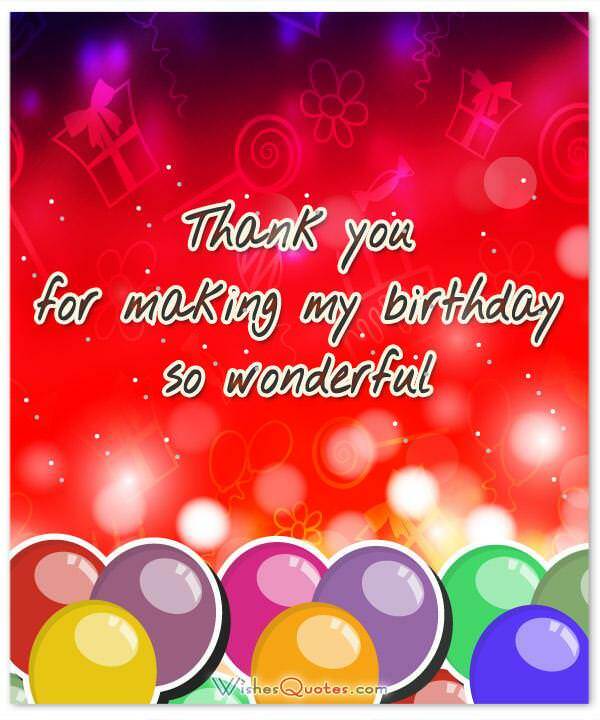 Many thanks from this birthday boy/girl. Over the years, we have shared our dreams and hopes. Broken hearts, shattered dreams and more – you helped me cope. 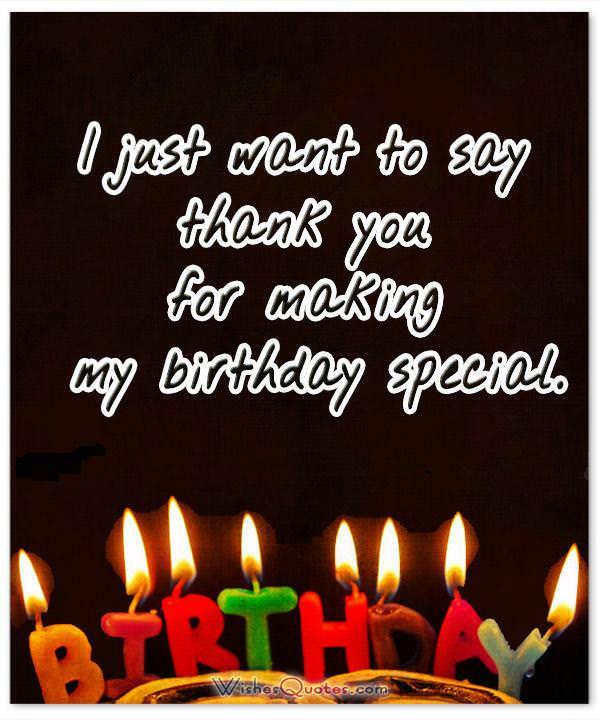 It was an honor to share my milestone birthday with you. Words are not enough to express how much I value your friendship. You are the real deal. Thanks for coming to my birthday party and sharing in the joy of the occasion. The brain ages; the body grows weary and beauty fades, but our friendship will live on forever. You made my birthday special. As we age, we learn that great fame and fortune can never be as important as finding all-season friends. Thank you for coming to my party. Another year, another birthday celebrated with the same old friends in the same fun way. What a blessing you are to me! Thanks. It was wonderful because of you. Thanks for joining my party. It could not have been more fun if Brad Pitt popped out of my birthday cake. Who needs Brad when I have you. Thanks for sharing the good times. It was awesome because you are awesome, and you shared your awesomeness by being the life of the party. You are my animal spirit. Thanks for joining my fun night. You, me, party. What an amazing night it was! 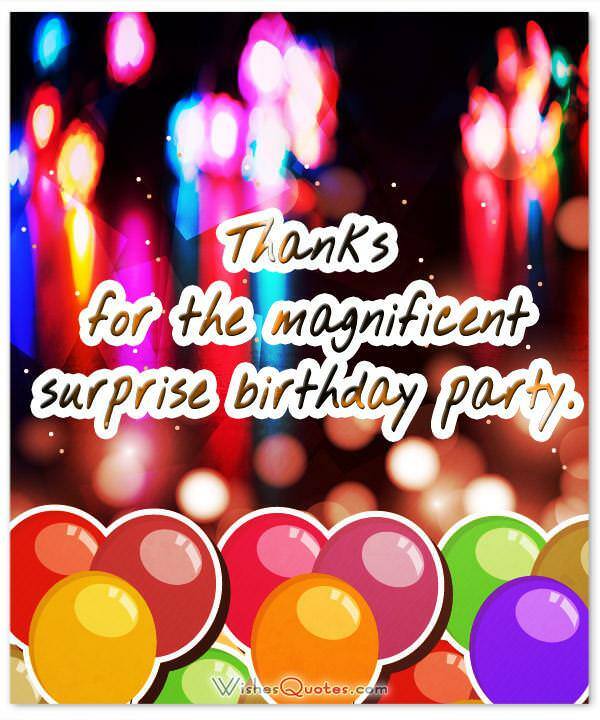 Thank you for coming to my birthday event. If I have to do this year after year, I would like to make sure that you are always at my side. Thanks for joining the party. Lovers come and go, but family remains constant. Here’s to many more birthday parties like last night. Life is a circle, and you are in the center of mine for all the great things you do to make me happy. I am grateful for your presence. The party would not have been complete without you. Here’s to more birthday parties celebrating our agelessness. A lady never discusses her age, so I’ll just keep you guessing. The party was incredible, and your presence made it even more so. I tried to switch off party mode, but it did not work. Now, I have a gigantic hangover but still grateful for your presence at my party. I tried to switch off party mode, but it did not work. Now, I have a gigantic hangover but still grateful for your presence. My heart sings with joy at thoughts of that wonderful birthday party. Thanks for being there. With you by my side, it was the party to end all birthday parties. Thanks, partner! Party goals: awesome party with awesome friends. Mission accomplished. I could not have asked for more. You made my party worth the cleanup chores. Thanks for shaking up my birthday party. Let’s do it again.